The consulate escape. A thrilling train ride on the Orient Express where ordering red wine with fish leads to a gripping fight to the death in a small compartment. An explosive boat chase. From Russia With Love is by far the most realistic and grounded spy story of the franchise, but it still packs plenty of iconic thrills into its final act. James Bond escapes onto the Orient Express with Soviet consulate clerk Tatiana Romanova (Daniela Bianchi) after stealing the film’s MacGuffin from her place of employment. They travel as honeymooning couple David and Caroline Somerset, but the subterfuge is short-lived and little needed as 007 confides in MI6 agent “Captain Nash”… in reality a cold-blooded SPECTRE assassin named Donald “Red” Grant (Robert Shaw). Bond is never totally trusting of “Nash”, but it is Grant’s dinner wine pairing that truly raises Bond’s suspicions and leads to a fight to the death in 007’s cramped train compartment while a drugged Tatiana snoozes next door. 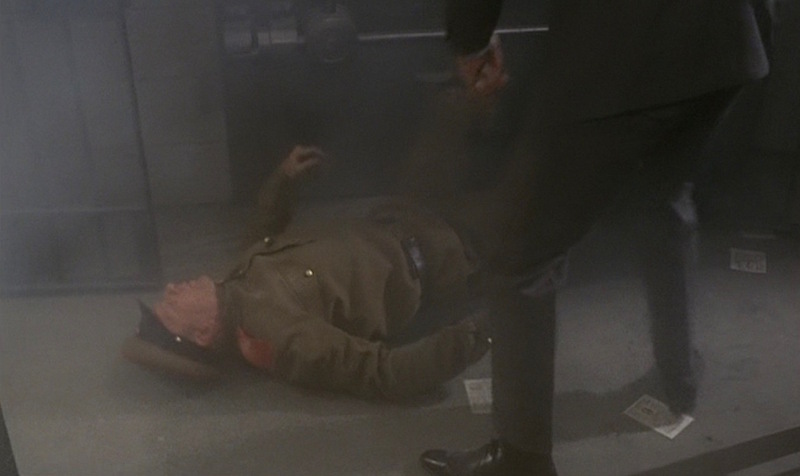 Supposedly, this brutal brawl took three weeks to film with both Connery and Shaw performing without the use of stunt doubles. Even this intense action is grounded in reality as Ian Fleming had incorporated his experience at an Interpol Conference in Istanbul with the true story of an American naval attaché that was assassinated by a Communist agent and thrown from the Orient Express in 1950. Bond is hardly out of the water once he and Tatiana escape from the train… there’s still two more deadly chases to go! 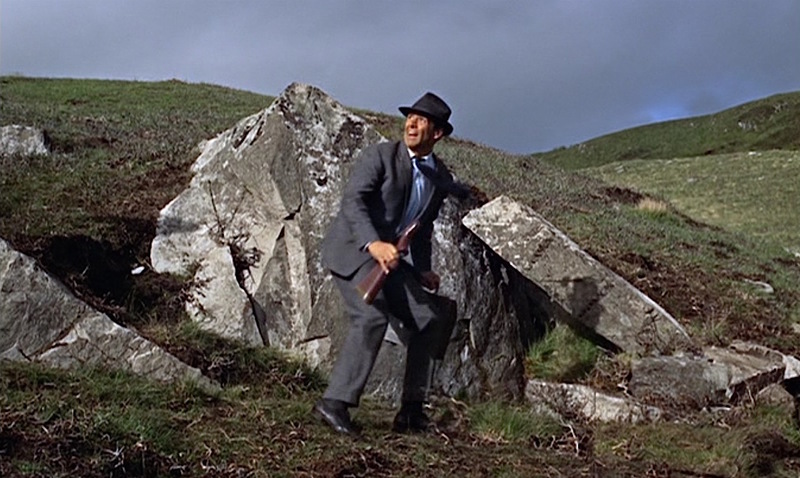 The film pays homage to North by Northwest as 007 is forced into a cat-and-mouse game with terrorists piloting a helicopter. Bond wasn’t the only one who nearly lost his life, as the helicopter pilot flew far too close to Sean Connery during the scene and director Terence Young was actually trapped when his helicopter crashed over the water. Despite injuries that left Young’s arm in a sling, the director went right back behind the camera to keep on filming. After escaping fatal forces from land and air, Bond and Tatiana take to the sea where they are again pursued by SPECTRE’s murderous agents. Again, it’s Bond’s quick wits and accurate trigger finger that save him… no gadgets needed. When Sean Connery took on the role of James Bond for Dr. No, director Terence Young modeled the character’s look after himself and ordered specially tailored Savile Row suits for Connery, supposedly even asking the actor to sleep in one to develop his comfort level in them. 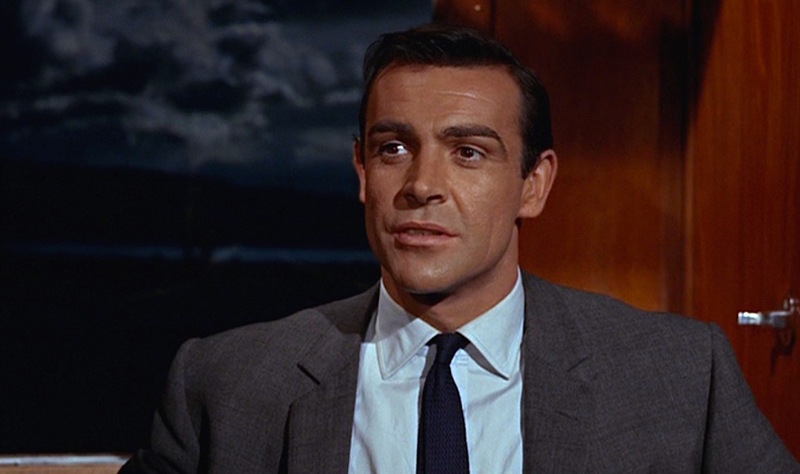 Young and Connery developed a de facto uniform for Bond that differed from the blue suits, white shirts, and black knit ties of Ian Fleming’s novels. 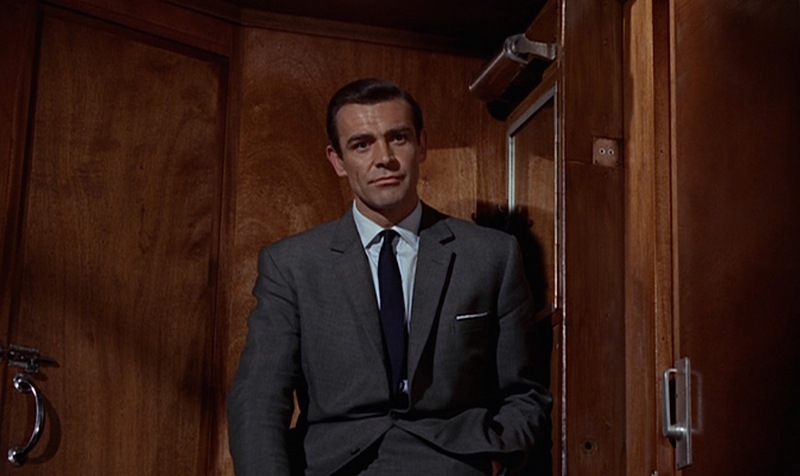 By From Russia With Love, Young doubled down on his investment and ordered eight tailored suits (including a dinner suit) to be tailored for Connery by Anthony Sinclair, each for around $2,000. 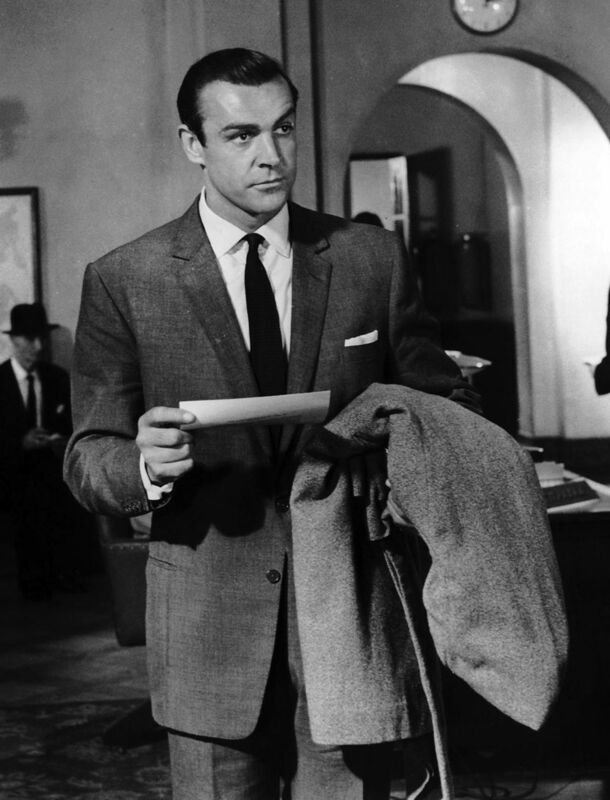 For this climactic sequence in From Russia With Love, Connery is outfitted in his archetypal 007 look of a gray “Conduit Cut” suit with a distinctive pale blue turnback cuff shirt and dark navy grenadine tie from Turnbull & Asser. Bond settles in for a cordial chat with “Captain Nash”. 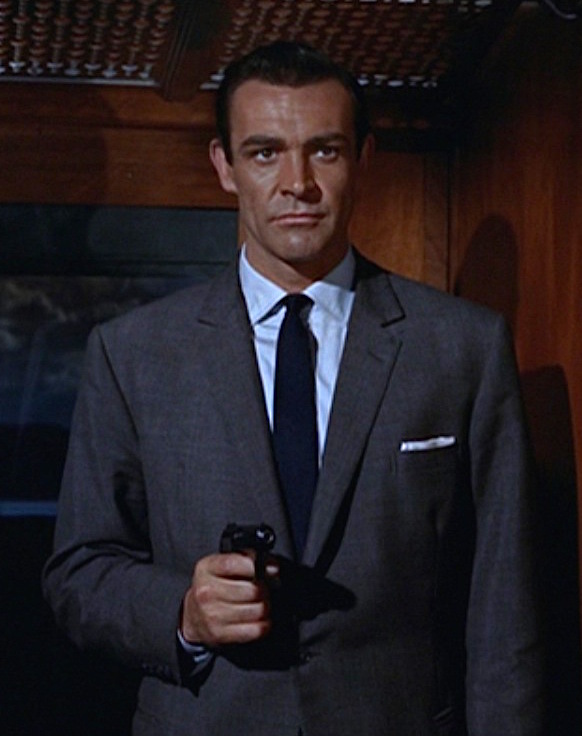 Connery wears a dark gray semi-solid pick wool suit, tailored by the legendary Anthony Sinclair. The lightweight suit makes it an ideal stunt suit for the variety of obstacles that Bond faces from the train fight to his various chases over air and water. In addition, the vision of a man running from reckless aircraft while wearing a dirty gray semi-solid suit with a ventless jacket may take the North by Northwest homage another step further. Whether it’s a cropduster in Indiana or a helicopter on the Scottish cliffs, you always want to be wearing the right gray suit to outrun the aircraft that’s chasing you. The single-breasted suit jacket features all characteristics of Sinclair’s “Conduit Cut” with its darted, fitted front, natural shoulders, roped sleeveheads, and a low 2-button stance that works in tandem with the slightly suppressed waist to draw attention to Connery’s athletic build. The full chest with its slight drape also allows for Bond to wear his Walther PPK in a shoulder holster without the obvious bulge of a slimmer fitting suit with a cleaner chest. Bond bids farewell to a new friend. Bond wears a white linen pocket square neatly folded into the suit jacket’s welted breast pocket. The straight hip pockets are jetted with no flaps for a cleaner look that also channels Cary Grant’s North by Northwest suit. Each sleeve has 4-button cuffs. The notch lapels are fashionably narrow for the era while still retaining a timeless width. Bond bargains for his life with gold sovereigns. Just another day in the life. Bond’s high rise trousers feature all the elements seen on his other suits. The waistband is beltless with a squared extended waistband in the front that closes through a hidden hook closure, and it is fastened on each side with a 3-button tab “Daks top” side adjuster. 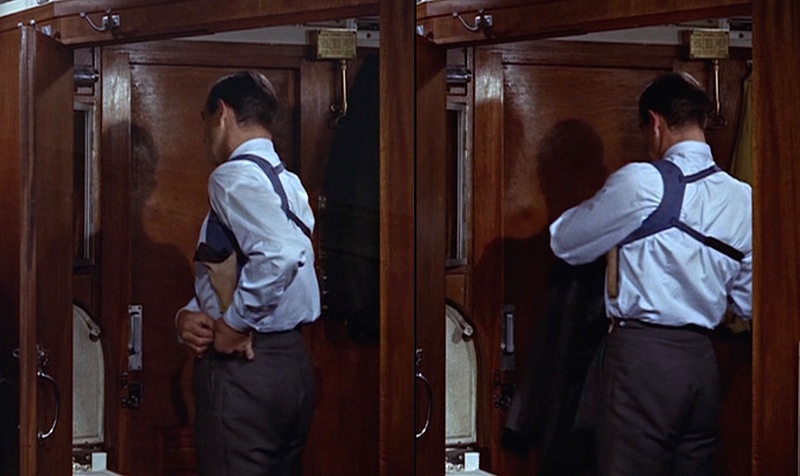 There is a slanted pocket on each side and a jetted back pocket on the right where Bond slips his PPK when he doesn’t have time to don his holster. They have double forward pleats with a full fit over the thighs and a tapered leg down to the cuffed bottoms. Note the usual double forward pleats and beltless waistband of Bond’s Sinclair-tailored trousers. With almost every suit in From Russia With Love, Bond wears a pale blue poplin dress shirt from Turnbull & Asser with a spread collar, front placket, and distinctive 2-button turnback or “cocktail” cuffs. This shirt appears to be a slightly lighter shade of blue than seen elsewhere in the film. 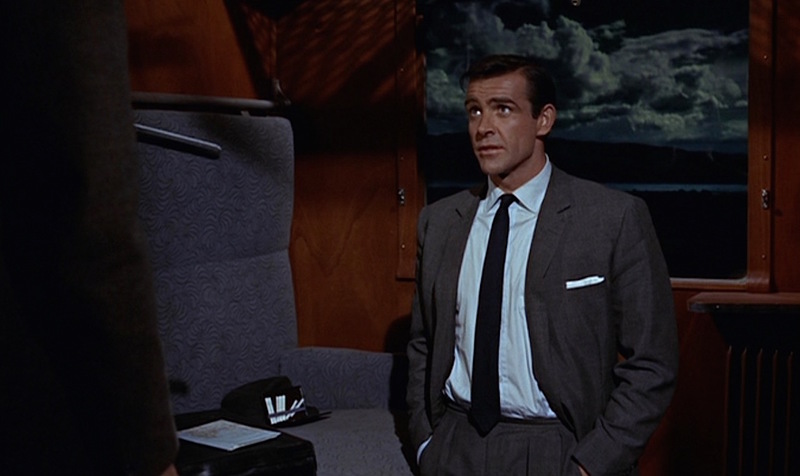 Bond’s dark navy grenadine tie is another part of his From Russia With Love “uniform” and also from Turnbull & Asser. The slim tie is likely just shy of 3″ wide, narrower than the ties in Dr. No, and is tied in a tight four-in-hand knot. As usual with his gray suits in From Russia With Love, Bond wears his usual pair of black leather plain-toe derby shoes with a three-eyelet, V-shaped cutaway front, worn with a pair of dark gray socks. This scene doesn’t feature a “Clark Gable moment” since 007 keeps his shirt on (at least he does on screen! 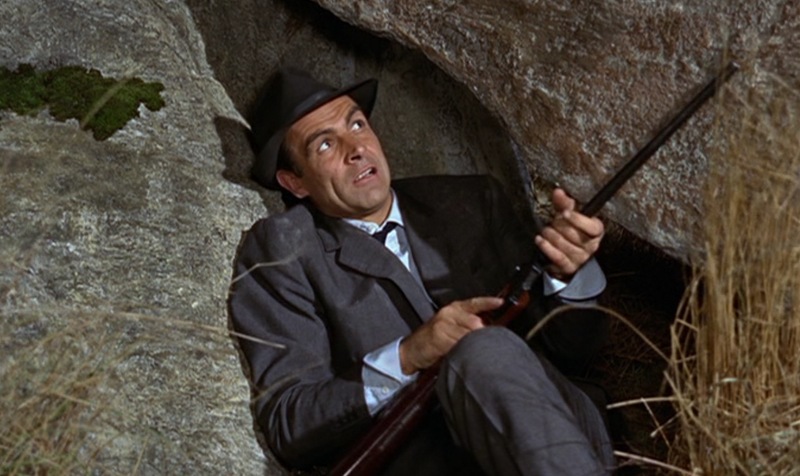 ), but shots of Connery without his suit jacket on reveal the outline of a white sleeveless A-shirt as an undershirt. Over his shirt, Bond opts for his usual tan chamois leather shoulder holster, fixed under his left armpit with a large blue shoulder strap over his left shoulder (connected to a slimmer blue strap that hooks around his right shoulder), giving his right-hand quick access to his trusty Walther PPK in one smooth move. 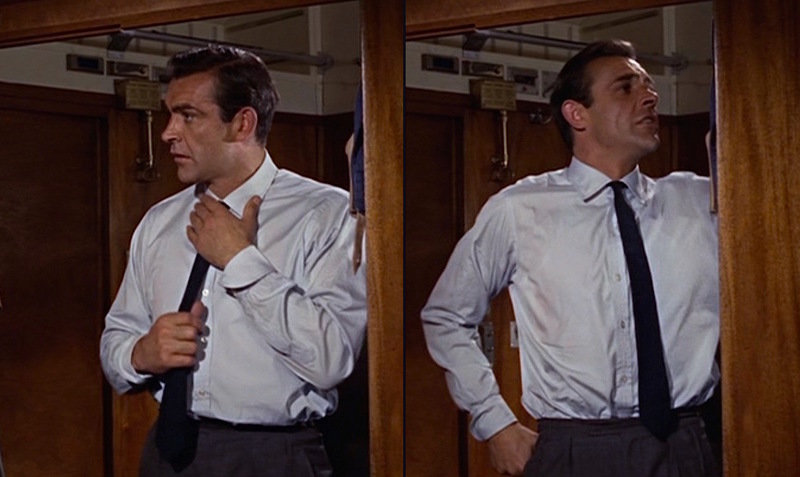 Bond fastens his holster to the left “Daks top” side adjuster buttons. Bond: Excuse me, you did say your clock was correct? Bond’s charming antagonism of a stuck-up Russian consulate clerk gives the signal to detonate a hidden tear-gas bomb while also providing an opportunity to show off his stainless Rolex Submariner 6538 wristwatch to the audience. Bond’s watch has a black bezel and black dial and is worn on a black leather strap. I have a feeling that Bond’s Rolex will tend to be more accurate than whatever Commie mass-produced clock that clerk is talking about. 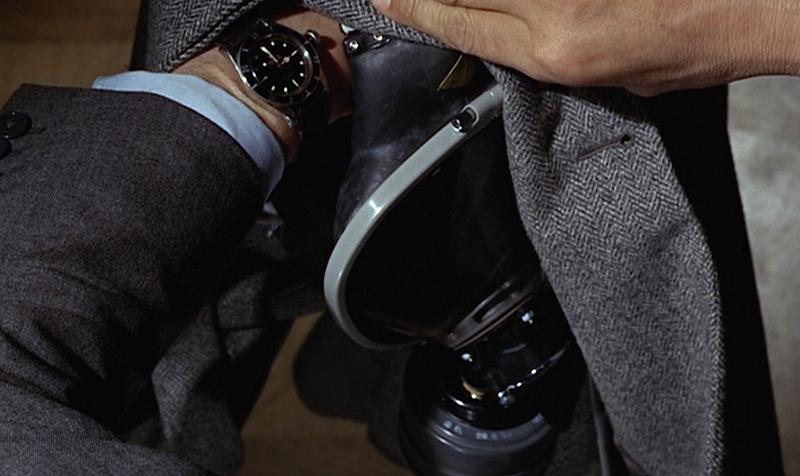 The glimpse at his watch also briefly shows off the details of Bond’s unworn overcoat, a three-quarter length single-breasted topcoat in black and white herringbone with peak lapels, a fly front, a welted breast pocket, straight shoulders with roped sleeveheads, and a single back vent. Although he never wears it on screen and ditches it while making his escape from the consulate, a behind-the-scenes photo of Connery and director Terence Young shows the actor wearing it to keep warm between takes in Istanbul. 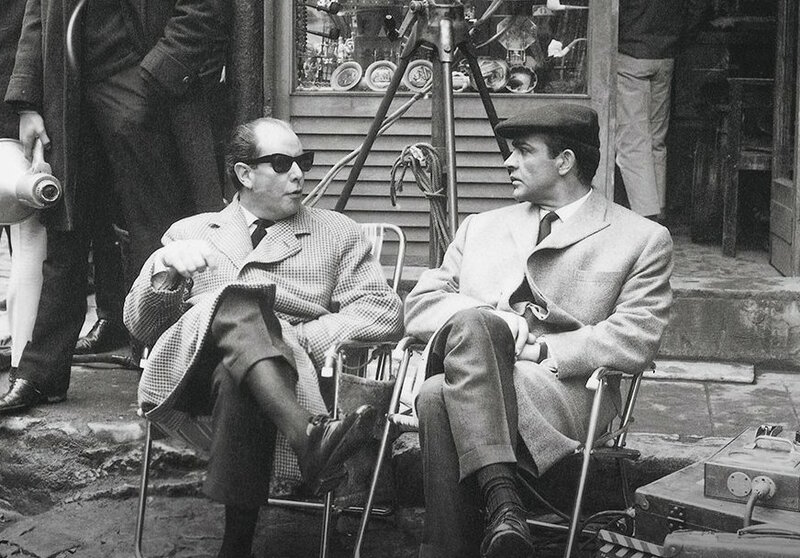 Young and Connery on set in Istanbul, 1963. The piece of outerwear that Bond does wear onscreen is his dark olive brown felt trilby that typically spends most of its time having been rakishly tossed onto Moneypenny’s hat rack. James Bond Lifestyle offers plenty of information about Bond’s Lock & Co. Hatters “Sandown” trilby, which is evidently still available from the St. James Street store in London. When Bond and Tania get to their escape boat, Bond adopts the look of a seaman by donning a heavy wool work jacket and peaked cap. The navy Melton wool single-breasted coat structurally and stylistically resembles a traditional British workman’s donkey jacket without that garment’s trademark leather-reinforced shoulders. Bond’s 4-button coat has hip patch pockets on the bottom of the front, a horizontal yoke across the upper back, and a single vent. As more of a worker’s jacket, it’s not intended to be worn over a suit and is just an additional layer that Bond wears for practicality to keep him warm while on the chilly sea. 007 isn’t above playing dress up when he takes to the high seas. Less practical is Bond’s decision to don a black peaked cap with a gold embroidered anchor and shiny black polished leather visor. Although fitting for the maritime setting and Bond’s commission in the British Royal Navy, it’s not really necessary to wear just because he happens to be on the water. It’s fun though, I guess. Red wine with fish… well that should have told me something. James Bond’s snobbery comes in handy when dining with Tatiana and his supposed MI6 contact, Captain Nash. From Russia With Love is one of of the more authentic portrayals of the “trust no one” world of spies, and 007 is never sure who around him can be trusted. The charismatic Kerim Bey, one of the few contacts he feels he can trust, ultimately proved his loyalty in a brutal fight to the death against poorly-tailored enemy agent Benz. By the time he sits down to dinner with Tania and Nash, Bond is able to veil his paranoia as he isn’t sure whether he can trust either of his dining companions. Bond and Tatiana are content to enjoy their grilled sole with the appropriate wine, thank you very much! Grant’s performance as Nash is flawless to a point, adopting a convincing accent and even an irritating, Gatsby-esque term of endearment (“old man”) that serves to make Bond more annoyed than suspicious. But it isn’t Grant’s frequent questions, his demeanor, or even his affectations that betray his duplicity… it’s the fact that he orders goddamn Chianti with his grilled sole. Before Grant clarifies that he desires “the red kind”, the waiter asks if he means “white Chianti”, which doesn’t exist. Either the waiter was uninformed, or he was being a snob in his own way. (I prefer to think the latter.) Either way, this scene has always freaked me out about ordering the “right” wine when I’m trying to impress someone, whether it’s a date, a boss, a foreign spy, etc. 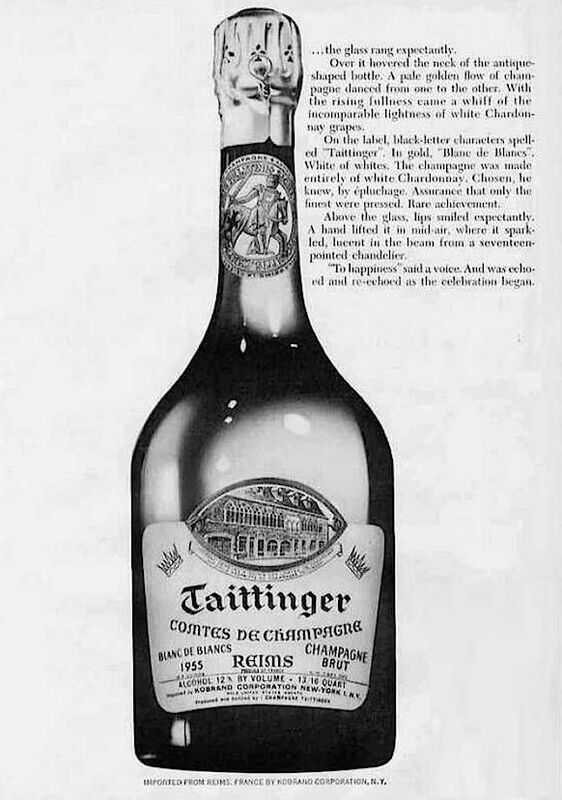 A Taittinger Blanc de Blanc ad celebrating the 1955 vintage, which is quite likely the very champagne that Bond and Tania would have enjoyed during their 1963 train journey. Taittinger’s association with James Bond goes back to the very first novel, Casino Royale, when Bond orders a 1945 vintage when dining with Vesper Lynd. The waiter instead suggests that “Blanc de Blanc Brut 1943 of the same marque is without equal” so Bond takes him up on his suggestion and uses the opportunity to mansplain to Vesper that Taittinger may not be as well-known as other champagne brands, but he finds it to be the best. A 1953 version of “you’ve probably never heard of it, but…” Bond is pissed that M’s club doesn’t have any in stock in Moonraker, but the agent gets an opportunity to once again enjoy his favorite champagne a few adventures later in On Her Majesty’s Secret Service. 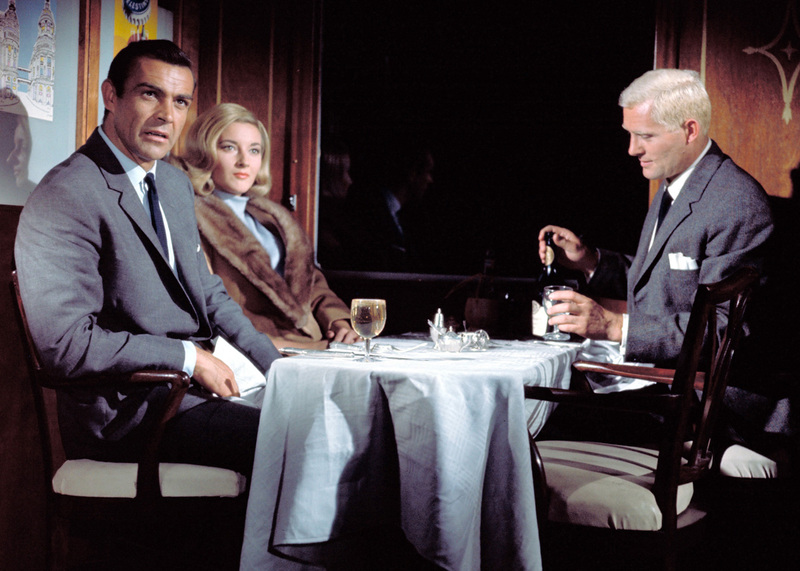 To my knowledge, From Russia With Love was the only official film in the EON franchise to feature Taittinger champagne as Bollinger and Dom Pérignon replaced it as the cinematic Bond’s preferred bubbly. 007’s gray business suit on the Orient Express is quintessential Connery Bond attire: a sharp, simple, and elegant suit appropriate for both loving and fighting. For more information about Sean Connery’s suit in these scenes, check out The Suits of James Bond’s blog post. Bond uses both his trademark Walther PPK and the Q-issued Armalite AR-7 survival rifle in these scenes, but the sequence’s most effective and memorable firearm is the signal pistol, a Webley & Scott No. 1 Mk. III*, that he finds on the captured boat and uses to ignite his discarded fuel drums during the boat chase. Part of me wishes Bond would have been armed with a blunderbuss here, just to fit the whole theme of him pirating a boat. At least that old WWI-era flare pistol has a few cosmetic similarities. More information about this single-shot, break open signal pistol can be found at IMFDB. 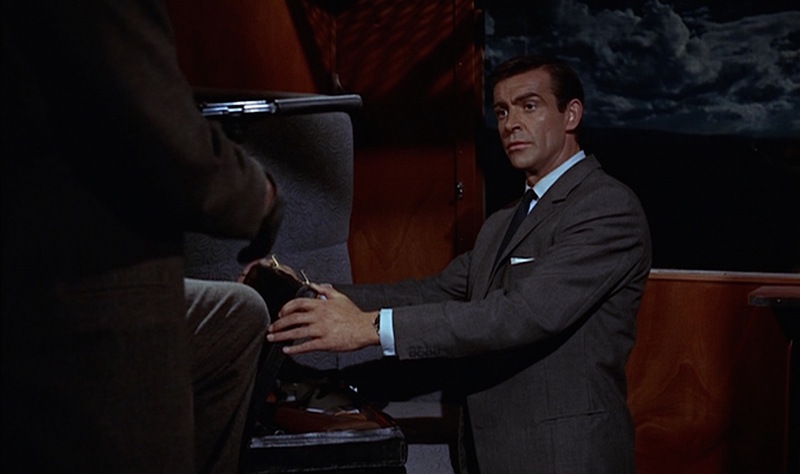 (If you were hoping to read about Bond’s use of the PPK and AR-7 in From Russia With Love, check out my posts about his charcoal flannel suit and the dark chalkstripe flannel suit he wears for the finale. Buy the movie and pick up Ian Fleming’s 1957 novel, which was very faithfully adapted to the screen. If you like the concept of Sean Connery involved in a killing on the Orient Express, check out 1974’s Murder on the Orient Express, based on Agatha Christie’s brilliant mystery novel. You know I love me some Agatha Christie. I’d say one of their aircraft is missing. 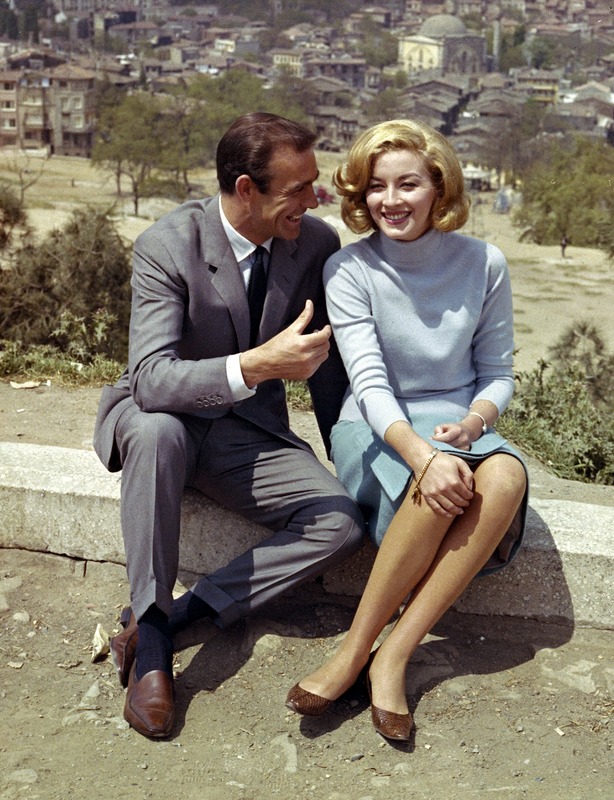 Sean Connery and Daniela Bianchi on location in Istanbul. Note Connery’s brown loafers and blue socks, evidently the actor’s personal preference when not wearing Bond’s black derbies. 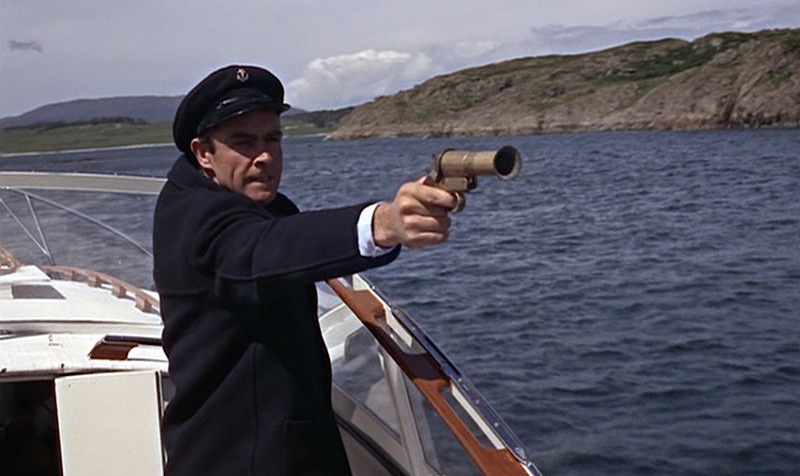 The production had meant to film the final helicopter and boat chases on location in Turkey, but logistical difficulties took the cast and crew to Argyll and Bute in the western region of Sean Connery’s home country, Scotland. 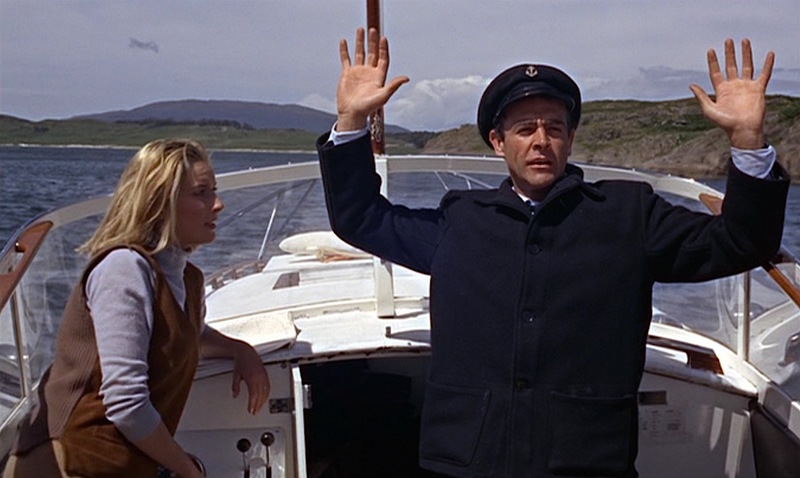 Bond evaded the helicopter at Lochgoilhead, boarded the boat with Tania at Lunga House, and finally blew up the boat’s fuel barrels (and Morzeny’s SPECTRE henchmen) in Loch Craignish. Nice to hear FRWL is your and Connery’s favourite Bond movie. Of course it was JFK who listed the book as one of his faves which then sparked it’s production as the 2nd film in the franchise. You could pretty much wear that outfit today and get nothing but compliments. Anthony Sinclair’s suits set the tone for the whole series in what Bond should and shouldn’t wear, there have been some experiments with suit styles over the years, but they always come back to the minimalist cut, colours and accessories of the first Bond suits. 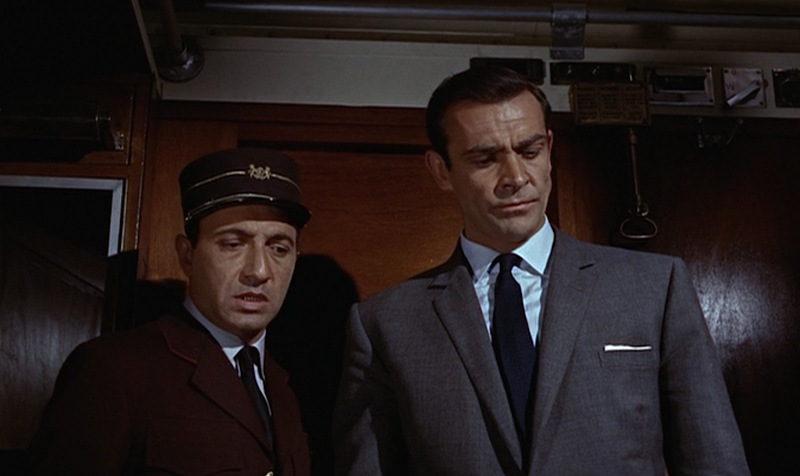 Dark solid ties and light shirts are still very much used in the Craig Bond films and are a strong tribute to Connery’s sartorial choices.